Alan Beckwith Macbro has recently installed a state-of-the-art thermal sand reclamation plant. Spent waste foundry sands are burnt in an oxidising atmosphere burning all hydrocarbons and combustible resins from the sand grains, resulting in a clean and thermally altered sand. Silica sand undergoes several thermal transformations upon heating. It is these thermal transformations and their resultant expansion/contractions that give rise to many of the foundryman's most worrying defects i.e. thermal cracking, thermal distortion and expansion defects. Thermally reclaimed sands exhibit unique properties due to the changes that the sand grains have undergone during reclaiming. The reclaiming process changes the crystal morphology of the sand grains resulting in a sand that has already passed through the critical expansion phase that occurs around 573°C. 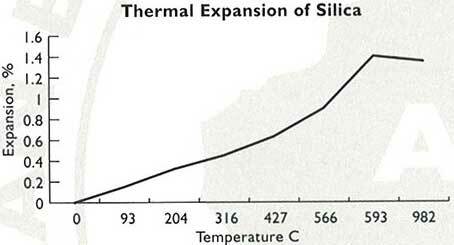 Normal silica sand is subject to rapid expansion at this temperature during casting resulting in thermal cracking of moulds, cores and expansion defects on castings. The process also results in a cleaner product, with all the organic, non-organic and low fusion point materials having been burnt off, (loss of ignition tests have returned zero results). Also as a result of the initial mechanical breaking down of the sand lumps and the normal attrition that occurs during the rough and tumbling process within the furnace and cooler classifier there is some rounding and smoothing of the sand grains. The resultant product gives superior benefits in the area of cost, quality, performance, OH&S and the environment. Macbro Thermal Reclaimed sand can be used for all types of chemical/resin systems. As a result of the thermal process, tests in actual foundry conditions have shown that lower binder and catalyst additions are required to achieve equivalent strengths. The thermal stability of the sand also makes it ideally suited to difficult casting applications; thin walled, complex and intricate castings, and particularly suitable for jobs that are prone to thermal cracking, thermal expansion and distortion defects. Typical applications have been in the areas of automotive water jacket cores, disc brake cores, inlet manifolds, pump impellers and hydraulic oil labyrinths. As equivalent strengths are achieved using reduced resin and catalyst additions, less emissions and gases are given off during mould and core manufacturing and during casting resulting in reduced gas related defects. Only silica sand of typically 55 to 70 AFS are currently produced. Cleaner sand grains that are thermally stable and have all the organic and non-organic material burnt off. Lower resin and catalyst additions, more consistent moulds. Cleaner sands require less resin and catalyst additions resulting in lower emissions during core/mould production and during casting which can only result in a cleaner, healthier work environment. Thermally reclaimed sand is good for the environment, reclaiming of spent foundry sand helps the environment in that we don't have to mine new sand, and the need to dump foundry sand into diminishing landfills is significantly reduced.